With the EPA hamstrung by the government shutdown, the NC Department of Environmental Quality has asked the NC Policy Collaboratory to sample drinking water for 26 types of perfluorinated compounds. DEQ samples weekly at five facilities — Bladen Bluffs, International Paper, Northwest Brunswick, Pender County and the Cape Fear Public Utility Authority’s Sweeney plant — and usually sends those to the EPA for testing. However, because of the 35-day federal government shutdown, most EPA employees were furloughed and couldn’t conduct the tests at the agency’s Athens, Ga., lab. Over the past month, DEQ’s samples have been refrigerated to preserve them. Even though the government reopens today, it’s expected the backlog of work could take weeks, even months, to plow through. And it’s possible the government could close again in three weeks if President Trump and Congress can’t agree on a border security plan. Detlef Knappe of NC State University, who with an EPA scientist was the first to discover these compounds in the Cape Fear River and drinking water supplies, is leading the project. Last year, the legislature budgeted $5 million for the collaboratory to award grants to more than 20 researchers within the UNC System to conduct PFAS testing and work on related research projects on the compounds in drinking water, air emissions — as well as ways to remove them to protect the public health. Collaboratory Research Director Jeffrey Warren said the group will cover costs, estimated at $10,000 per month. That is equivalent to five samples at $500 each, per week for a month. The collaborators is awarding an initial $50,000 grant to Knappe to cover the two-month backlog, which started even before the shutdown, as well as sampling, through the end of April. The EPA took as long as six weeks to analyze the samples and return the data. Warren said the collaboratory scientists could do that in half the time. 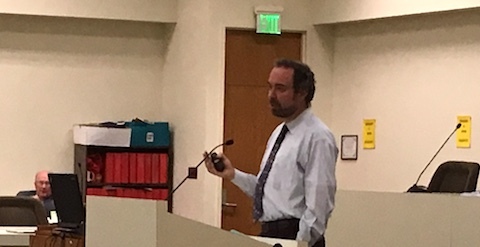 Duke University scientist Lee Ferguson has also offered to train a DEQ employee, especially hired to operate a mass spectrometer to do in-house PFAS analysis, on the equipment. The mass spec, as it’s known, is identical to the one Ferguson uses in his laboratory. He will set up the system, shaving six months to a year off the agency’s start-up time, Warren said. Duke University is not part of the UNC system covered by the collaboratory, so Ferguson will offer these services to DEQ for free.